Do you like playing poker, but dislike the slow paced play that most recreation poker rooms play at? Then Let It Ride might be just the game for you. Let It Ride is a poker based game that offer a potential to earn big time payouts if you are able to hit a big hand. Let It Ride is a great game because it does not require a lot of strategy to remember, and the game moves quickly. It is also popular because you aren’t playing against the other players at the table nor are you playing against the dealer, your hand is not reliant on anything but your dealt cards and the community cards. The strategy for this game is fairly easy and most folks pick it up quickly. This is a table game using a table similar to the one you find when you play Blackjack. In front of each player’s seat, there will be three different circles on the table, and each circle will be marked 1, 2, and the third will have this symbol: $. At the start of every hand you will place your bets out in each circle, and each bet will be for equal amounts. 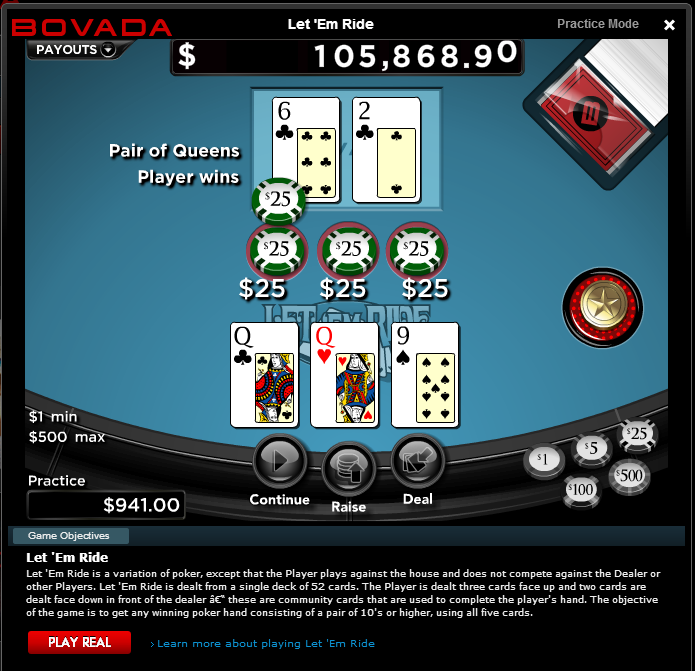 Depending on where you are playing, you may also have the option to make bonus bets, and three card bonus bets. These will usually payout progressively on specific hands, and should you hit a Royal Flush and be betting the bonus circle, you could win as much as twenty-thousand times your wager. Once the bets are placed, you will be dealt three cards. After each player gets his or her cards, the dealer then places two cards face down on the table. At this point, you will look at your hand, and then you will have a decision to make. You may either take back or “pull” the bet from the number 1 circle, or you can Let It Ride. Once all the players at the table have declared that they are either taking back their number 1 bet, or are letting it ride, one of the community cards are flipped over. You now use this card as part of the hand you are building. At this point, you have the option of pulling back the second of your three bets, or, again, Let It Ride. One thing to remember is that even if you have already Let It Ride on the first bet, you can take back the second, however once a betting round has passed, you may not take down or post any previous bets. Once this round takes place, the second of the community cards is flipped over, and another round of decisions take place. At this point, you do not get a choice to pull back your wager from the $ circle, you are obligated to play it. You will then be paid out if you have a winning hand in accordance with a progressive payout depending on the hand strength. If you have a single pair, tens or higher, you are going to get paid one to one, two pair will get you two to one, and three of a kind will get you three to one. If you manage to get a Straight, it will typically pay five to one, with a Flush paying eight to one and a Full House paying eleven to one. From here the payouts take a substantial jump, with four of a kind paying fifty to one, a straight flush paying two hundred to one, and a royal flush paying a whopping one-thousand to one. Your hand is already a winner, meaning that you have a pair of tens or better, if you have a three card Royal Flush, and when you have a three card Straight Flush. You have an hand that’s already a winner, meaning a pair of tens or better, if you have a four card Royal or Straight Flush, if you have four cards to a Flush, if you have an open ended straight, or if you have four cards ten or better. Outside of those guidelines, your chances of winning are far less. In a game where the house already has a few percent edge before the game ever starts, you need to play as optimally as possible. Let It Ride is a fast paced game, but it is still a little slower than Blackjack, so you will find your money lasting longer. You can find Let It Ride online at almost every casino, for both play money and real money, so try and hit one of those high hand bonuses today!